Daredevil's wacky power #9 - What time is it really? I suppose this is another example of the artist not bothering to do a little research before drawing it, but we have to remember that there was no Google in the 60’s, and few people have really known someone who has a braille watch. That’s still no excuse for common sense! 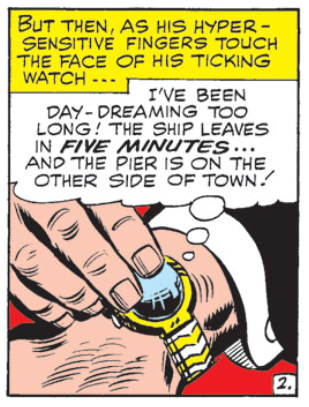 y’know, i’ll happily suspend disbelief, and say “sure, DD can feel the position change with the ticks”…but that still doesn’t excuse the intellectually lazy writer from not looking at the Murdock angle – how does a blind guy with a secret identity explain wearing a regular watch? I can justify this to myself by saying it was the artist’s fault and not the writer’s. It is indeed a Braille watch. Although Matt’s hypersensitive fingertips are indeed touching the watch, that’s not saying it’s the fact that his fingers are hypersensitive that allows him to tell the time, and the artist just didn’t draw the crystal hinged back from over the face of the Braille watch. Do I get my Marvel No-Prize now?